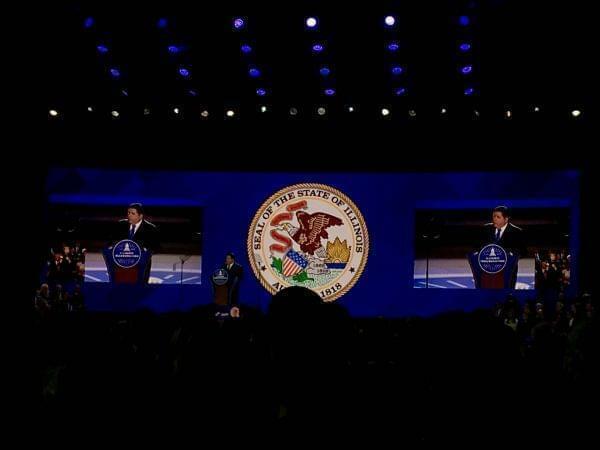 On the 21st: On Monday at 12:01 pm, J.B. Pritzker took the oath of office and become Illinois' 43rd governor. Niala Boodhoo and Brian Mackey hosted this special Illinois Public Radio coverage of the inauguration ceremonies. "But be clear about this: I won’t balance the budget on the backs of the starving, the sick, and the suffering. I won’t hollow out the functions of government to achieve an ideological agenda – I won’t make government the enemy and government employees the scapegoats. Responsible fiscal management is a marriage of numbers - and values." ​The current tax system is simply unsustainable. Others have lied to you about that fact. I won’t. The future of Illinois depends on the passage of a fair income tax, which will bring us into the 21st Century like most of our midwestern neighbors, and like the vast majority of the United States. "​It is time to update and repair our state’s aging infrastructure. Railways, roads, bridges and fresh water arteries are on the verge of collapse. Crumbling bridges mean people’s lives are in danger. Deteriorating rail systems mean goods and services take longer to deliver and cost more. We are the nation’s supply chain hub and we must be built like it." ​"I believe in science. To that end, as one of my first acts as Governor, Illinois will become a member of the U.S. Climate Alliance, upholding the goals and ideals of the Paris Climate Accord." "​In the interests of keeping the public safe from harm, expanding true justice in our criminal justice system, and advancing economic inclusion, I will work with the legislature to legalize, tax and regulate the sale of recreational cannabis in Illinois." "At 200 years old, Illinois is still a young promise. Our time here has been but a blink. In 2019, we must begin a new century with new maturity…and enough foolishness to believe we can make a difference." "Our history is a story of leaps forward and occasional stumbles back - and a promise renewed with each generation that we will try harder…that we will do better…that big breakthroughs are built of centuries of selfless effort by unheralded heroes …that big change rides on what we can do together, not what one person attempts alone." We're coming to you live from Springfield where @JBPritzker will be taking the oath of office today. @NialaBoodhoo & @BrianMackey kick it off our special coverage @ 11am! @JBPritzker mentions downstate Illinois, to lots of cheers: “We must bring a renaissance to downstate Illinois which has been deprived of some basic resources for education and business building that are taken for granted elsewhere in our state."